embroidery, jewellers, medical clinics, low vision, eye sight impaired, etc. Glass lens - round 12.5 cm. 2.2 times Magnification (5 dioptre). Comes with round Fluorescent 22 watt globe. Pedestal base is mobile - 5 legs on wheels. Bracket handle for easy Lamp adjustment. Warranty period of 12 months. Mag Lamp regularly purchased by Beauty Salons. CAPG002B - Black Beauty Mag Lamp on movable Floor Stand. CAPG004W - Mag Lamps with rectangular 5 dioptre Lens resting on a mobile heavy duty pedestal. CAPG005 - Small and Light weight Magnifying Lamp with Fluorescent Bulb. CAPG005LED - This Portable LED Magnifying Lamp has 60 LED diodes circling the Glass 3 dioptre lens. The Magnifier lens also has a small 12 dioptre Magnification section to enable closer examination when required. CAPG006B - Black Mag Lamp with flexible arm. CAPG008B - Black Beauty Table Lamps. CAPG008W - Beauty Mag Lamps. These Lamps have a 22 watt Bulb and come with a Table mounting Bracket. They are used extensively by Beauty technicians in facial treatments. CAPG010 Magnifying Lamp with strong light source. 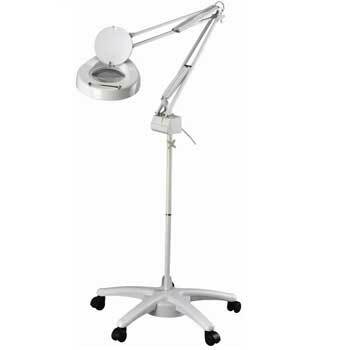 CAPG012W - Magnifying Lamp with larger viewing surface. CAPG040 - This LED Magnifying Lamp consists of 108 diodes around the Lens. CAPG041 - LED Magnifier on Stand. CAPG090 - This LED Magnifying Lamp consists of a Lamp with 90 diodes. Bought mainly by Beauty Salons doing eyelash extensions. CAPG091 - LED Magnifying Lamp on Pedestal. CAPG001WL - Round Glass Lens. CAPG003WL - Rectangle Glass Lens. CAPG030B - Black Floor Stand. CAPG030W - Floor Stand for Mag Lamp (white). CAPG031B - White Floor pedestal. CAPG031W - White Floor pedestal. CAPG050B - Wall mount for black Magnifiers. CAPG050W - Wall mount for white Magnifiers. CAPG051B - Strong black Clamp. CAPG051W - Strong white Bench mount. CAPG052B - Black Bench mount. CAPG052W - White Bench mount. CAPG053 - 9 watt Fluorescent Bulb with 2 pins. CAPG053A - 9 watt Fluorescent Bulb with 4 pins. CAPG054 - Replacement Fluorescent round Globe for Beauty Lamp - 22 watt. CAPG056 - Fluorescent rectangle Globe - 28 watt. CAPG057B - Black Table mounting Bracket. CAPG057W - White Table mounting Bracket. Delivery of Magnifying Lamps or spare parts can be organised for anywhere Australia wide. Payments accepted online with MasterCard, Visa using PayPal. Want more details than call us on (02) 6162 1950 or send us an email. Floor Standing, Desktop and Clamp models plus accessories available. All Magnifiers and other Beauty Equipment can be inspected at the Canberra store.